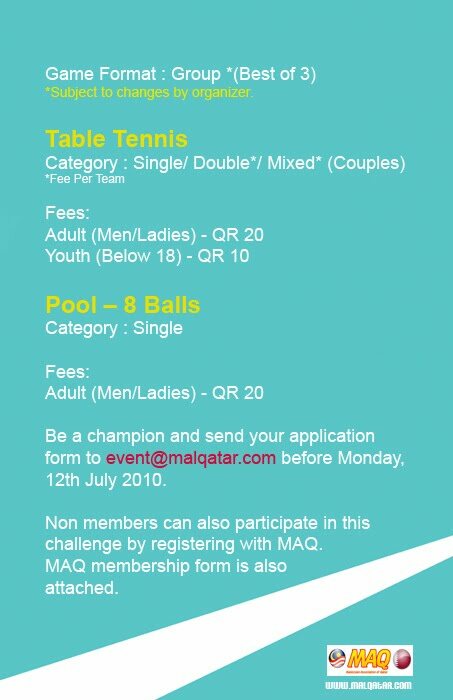 MAQ 8 Balls and Table Tennis Challenge are back again by popular demand!!! The challenge is open for men, ladies and youth (below 18) and all skills level are welcome. So bring your families and friends together and let us have an exciting and a healthy weekend. 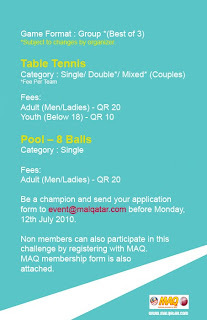 Be a champion and send your application form to event@malqatar.com before Monday, 12th July 2010. Non-members are also welcome to participate by registering with MAQ (MAQ membership form is also attached). Payment for the Challenge and MAQ membership can be made at the day of the tournament. For any help or further information, please contact 5883648 (Zalman). Finally, let us take this opportunity to meet new friends and expand our Malaysian network in Qatar.